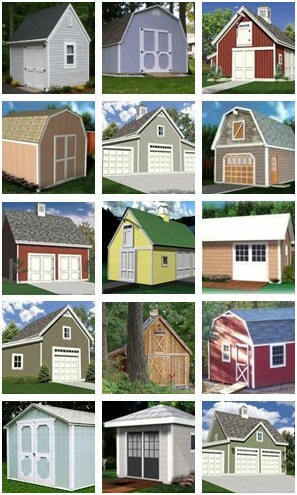 Get Started on Your New Shed, Mini-Barn, Workshop, Barn, Pole Barn, Garage, Carriage House, Car Barn, Craft Shop, Backyard Studio or Workshop Right Now. Choose from dozens of great designs and print any and all of the building plans, as often as you want, with one easy purchase. And, your cost will be less than single set of blueprints from most other websites. Your plans will be delivered instantly by a link to an easy-to-use web page with construction drawings for the buildings shown above and dozens more. In all, you'll be able to build any of more than one hundred different building designs, layouts and sizes. You'll also be able to download all of the plans and print as many copies of each as you'd like. Click on the links below to read more, to see more of the buildings in the set, to see floor plans, to read customers' reviews or to order all of the blueprints for just $29.00 today, with a no-risk, no-nonsense, no-questions asked, 60 day money-back guarantee.